This site is 7 years, 4 months and 5 days old, which is exactly how long I’ve been meaning to tell you about one of my favorite ways to make cauliflower. You think I would have gotten around to it already, as it’s the very cauliflower dish I ever knew, but instead I’ve been distracting us with quiches* and soups, and pasta and fritters. It’s a shame, as this is so much easier to make. My mother used to steam a whole head of cauliflower, and when it was about done, melt a pat or two of butter in a cast-iron frying pan (back when all of our skillets were cast-iron, and I found them heavy and annoying and embarrassingly old-fashioned; oh, Deb), then toss in enough seasoned breadcrumbs (always seasoned “Italian-style” which makes me chuckle because what would Italian seasoning be in Italy, salt and pepper? **) to absorb the butter and cook them until they were a browned together. This would be sprinkled on and pressed against the cauliflower and it’s really no surprise that I become a cauliflower person, is it? Salty butter, brown butter-crisped crumbs will do that to a person. I make it almost the same way, but of course, I’ve fiddled a bit over the years. I prefer browning the butter a little bit before adding the crumbs because, obviously: brown butter. I use plain breadcrumbs (panko, Japanese-style breadcrumbs are my favorite) but I add a little bit of minced shallot, garlic, finely grated lemon zest, salt and pepper for seasoning, plus some parsley or chives, and I dress the cauliflower with a little bit of lemon juice before putting the crumbs on, just to perk it up a little. This is an ideal dish for a weekday night, or even that little holiday you may have heard of that’s coming up next week? It’s kind of minor, so don’t sweat it. The dish doesn’t care whether you steam or roast you cauliflower, whole or in chunks, or if you make it in advance. 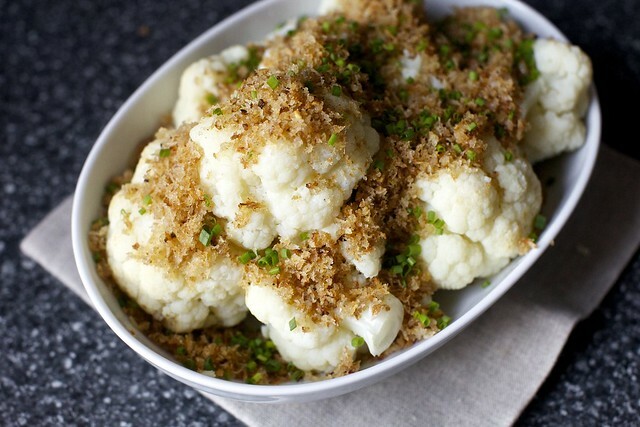 The cauliflower and crumbs can be made separately, then re-warmed together before serving. You can very likely make this with ingredients you already have around. And nobody, or nobody I want to be friends with, finds the flavor of deeply toasted, brown butter-drenched breadcrumbs with minced shallots, garlic and lemon less than spoon-worthy. The best stuff falls to the bottom of the serving dish, and that’s exactly where you’ll find me, swatting your spoon away with mine exhibiting the warmth and generosity of the season by giving you dibs. Yup. * Oh, phew. I think I just figured out what to make for dinner tonight. More Thanksgiving this week: I realized near the end of last week that I had five Thanksgiving dishes left to share with you, and wouldn’t it be fun to post each day this week about one? So, Monday was Green Bean Casserole with Crispy Onions, Tuesday was my favorite Apple-Herb Stuffing for All Seasons and today is cauliflower. If all goes well (so many tiny inconvenient things — meetings and tests and tours and a waning case of laryngitis — are plotting against us this week, but I’m going to persevere), there might be some sweet potatoes, regular potatoes, squash or a campy dessert before the end of the week. I love these dishes too much to keep them from you any longer. Don’t have a steamer basket? Me neither, or not one I’ve been able to find in a couple years, which probably means it’s an Elmo cradle somewhere. Anyway, I suspend a mesh metal strainer with handles over the pot with bubbling water, and set the lid on as best as possible. More water escapes (it’s best to check it halfway through, and make sure you don’t need to add more), but it does the job just fine. Why panko? They’re fluffy and pale, light, crisp and neutrally flavored, thus they are great to keep around for times when you don’t feel like making your own. I keep mine in an airtight jar in the cabinet and they last a long time. 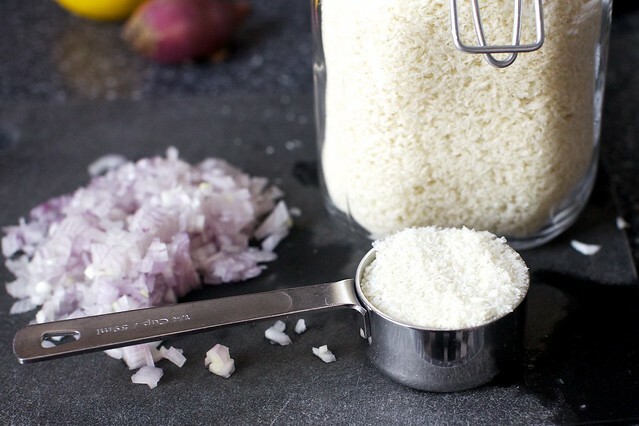 Brown butter crumbs sound spectacular – especially as I love panko breadcrumbs! 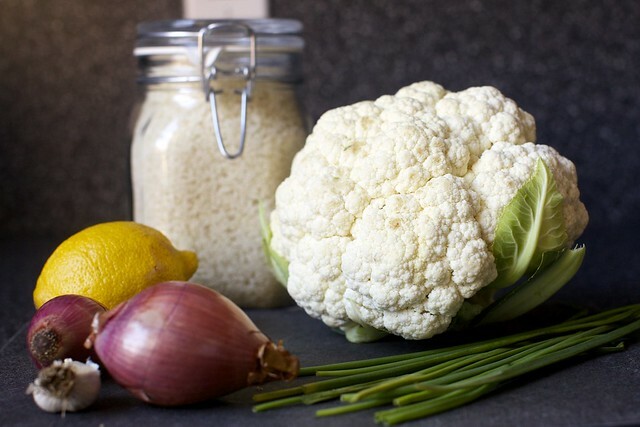 But I’m not sure how I feel about cauliflower – does it really transform the taste of it? yessssss so delicious! great for tday! That looks so so goos! I want to be offended by this, because lets face it- creamy cheese sauce is the way to go on steamed cauliflower and broccoli. But then I realized – I can basically use cauliflower in place of pasta in homemade mac and cheese, and then put browned bread crumbs on top anyway.. for… authenticity! I just found out what I’m making for my very retro dinner tonight. I grew up eating this dish made by my polish mom. She also served these addictive crumbs on steamed green beans. My mom would make something similar every year for Thanksgiving! Love!! My favorite trick for making bread crumbs is to start by cubing bread, and then instead of pulsing in a food processor, use the shredding disc instead. Just as easy, and much quicker! I also keep them in the freezer for use in meatballs, lovely recipes like this, topping casseroles, etc. Lovely recipe! Lots of butter and spices! Just the way I like it. The site has been around for along time, I defiantly remember the early days :) I love your writing and cooking..
My mother used to make this for our family when I was a child. I’ve loved cauliflower ever since. This dish brings back happy memories. definitely trying this asap!! I need more easy & delish side dishes in my life like this. You had me at brown butter crumbs (the cure to most things!). If you were thinking about it for over 7 years, it must be worth trying, hahaha. If you really like brown butter, you can also brown skim milk powder in the butter for more brown butter solids. WHY HAVE I NEVER THOUGHT TO PUT MY PANKOS IN A PERMANENT CONTAINER. Sorry for the shouting, but that’s what I thought when I saw your picture above. The bag always make me crazy, spilling little white showers all over the place. I have so many extra mason jars, just for this reason!! Thanks for the brilliant, if inadvertent, suggestion. You can hold aside some of your stuffing mixture, grind it in the food processor and brown it in the browned butter and use that on the cauliflower. It’s already seasoned and just needs the browning. Hi my friend, I love your recipes! I’ve been making a brined cauliflower lately that is unreal but this sounds awesome. Now I know what I’m making for dinner! Anyhoo…you have a minor typo and I know you’d like to change it, so instead of placing pan over medium head, I’m going with medium heat. No worries! thanks for everything–keep up the Gluten Free substitutions, too, please! Wow, seriously? This is such a coincidence. Only a few hours ago I searched your website (which I know only for a few days and yet you’ve managed to reach my fav websites and my birthday wishlist – your book, I mean) for a recipe with cauliflower and now, this appears. So excited to make this dish! It looks simply wonderfull. If you add in a few chopped hard-boiled eggs, you’ve got the impressive-sounding Cauliflower Polonaise. The eggs makes it seem almost decadent, and something I could totally eat on its own for a meal. Such a simple dish… and anything with butter and bread crumbs is right up my alley! Delicious. What will we all do when the little blue star indicating a NEW Smitten recipe doesn’t appear every single day? You have us spoiled now, Deb. (Just a “heads up” for the sake of your own sanity. )This will be a staple of mine, as cauliflower is a huge family favorite- sounds yummy w/ brown butter. kari — Yes, thanks, now fixed. OMG, is this Jersey Cauliflower? — I hope so. That would be awesome. I didn’t think my mother’s cooking was particularly influenced by where I grew up (she’s from Queens) but you never know. I’m going to ask her where she got the idea and report back. Oh gee! Do you think this is a New Jersey thing? My mom did the same when i was growing up (a number of decades before you!) And silly me. I transplanted to the Midwest, and as I was raising my family, forgot about this. Woe is me – none are cauliflower people!!! I may resurrect this for Thanksgiving anyway …. This is one of my favorite dishes from my mother as well (also from NJ! ), though she would just mix Italian breadcrumbs and Parmesan cheese with olive oil until it formed crumbs, and then would pack that over steamed cauliflower. I made my mother’s dish last weekend, so I’ll have to try your version this weekend! Oh man. Now I want to put brown butter crumbs on everything! I have never tried cauliflower this way. Sounds delicious. I do steam my cauliflower most times but usually serve it with a cheese sauce. That is borning after seeing this recipe. Love it! Gotta love the simplicity of veggies with bread crumbs on top! MMM! There is actually a recipe for this? I just figured my mom made it this way knowing we would eat anything that was covered with browned butter! I grew up in central Texas, so I don’t think it’s just a NJ thing. Just the thing for the cauliflower sitting in the fridge my husband brought home (probably not knowing that I never know what to do with a cauliflower!). Typo, I think in first paragraph…is it the very “first” cauliflower dish you knew? Many thanks for putting out these extra recipes when we all know you are not feeling your best…get well so you can enjoy Thanksgivnnukah! I discovered a similar version of this recently that called for this combo over orrecchiette. My husband was not interested when I said I was going to eat it. He opted for a salad. But when I offered him a bite, he immediately requested I bookmark the recipe. He couldn’t believe it was such a simple recipe. Thanks for the reminder! Definitely Jersey cauliflower. My Mom (born in Upper Manhattan with a German mother) made it the same way. This is how my mom makes cauliflower too. And she’s from New Jersey. No, no, no, you brown the breadcrumbs first and *then you add the butter – it prevents them from soaking up the butter too fast and getting super greasy! This is the exact same way my mom got us to eat broccoli as kids. My grandmother made it exactly like this for every holiday (minus the shallots and lemon). What a wonderful memory this brought back to me! This sounds so good! I love cauliflower in pretty much any form, so this is right up my alley! My mom used to make it like that as well, but she also added a good pinch of nutmeg. Delicious! Yum, made something similar last week with brown butter and chopped capers, which I could see adding here. If you are thinking about a turkey for next year, consider dry-brining. Sort of Zuni Cafe chicken meets the Pilgrims! This looks amazing, I think I will add this to my Thanksgiving lineup! Just FYI since you host all of your images on Flickr rather than on your site I can’t pin your recipes on Pinterest. When I do it just takes me to your Flickr site rather than linking back to the recipe which is what I want to do. Might want to think about changing that up, since I know a LOT of people would love to pin your amazing recipes! ^^ p.s. nevermind, somehow it worked itself out now! Maybe I was experiencing a bug before… Thanks again for your amazing dedication to delicious food! Excellent! This is a near cousin to my mother-in-law’s dish that we affectionately call “Crumby Beans” (whilst enjoying the little pun of the name). Why we never thought of applying the whole crumby concept to other worthy veggies, I don’t know. But as this preparation is a family favorite, I foresee many crumby-atizing attempts ahead. Thanks for the inspiration! So simple and delicious sounding! I wish I had some cauliflowers right now! Hi Deb, Thanks for all the amazing Thanksgiving recipes! Do you think this would also be a good preparation for roasted brussel sprouts? I want to make some for Thanksgiving, but would like to give them a little pop! Hope you feel better! Thanks again. I am always looking for new ways to prepare cauliflower! I love the stuff! Coincidentally, I just made your cauliflower gratin last night. This looks great as well! Looks awesome and reminds me of a similar cauliflower recipe that dinneralovestory.com posted last year at Thanksgiving from Sam Sifton’s book (noticed your mention of him in the green bean casserole recipe! ), main difference is that the bread crumbs had some anchovies in it (at least that is the main difference I remember off the top of my head!). 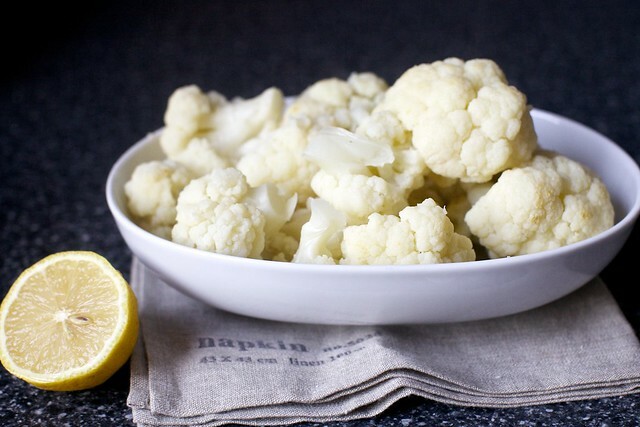 Adding this recipe to my list of ways to make cauliflower delicious! Thanks Deb! My mom used to do this with cauliflower, broccoli, Brussels sprouts, etc. It’s still my favorite! oh now this, THIS, has a place on our table, not just on turkey-day but any time. i love me a batch of browned butter bread crumbs, but never once did it dawn on me to tumble them over cauliflower. what a wise, wise grandma smitten. thanks in advance! Shocked that you boil the cauliflower instead of roasting. Loving this, signed one of your fans in Sydney. I really think you should come out here soon. Your palate/recipes are so simpatico. In the meantime, just wanted to say anything with butter and lemon zest is on the road to happiness. Always look at your site for inspiration. Even if our seasons are upside down. Nice vegetarian dish. Can I adapt this making it vegan? Nicoiul — The breadcrumbs can be fried in olive or another oil instead, but it will not have the depth of flavor that comes from brown butter. Still, it would be tasty. AG — I didn’t boil it, I steamed it, which I did because that’s the way my mother always made it. Roasting directions are included. Is this really shocking? Re, is this recipe a German thing? — Now I really want to know. My mother is 100% German; she says her mother made it, but she thought it was just thrown together, nothing particularly Germanic about it. Anyway, I love hearing that it wasn’t just my mom who made this. It’s such an easy weeknight trick to keep in your back pocket, and it makes something as dully and wholesome as steamed vegetables really fun to eat. Ruthie — Thanks for sharing! Love that show. Andrea — Definitely. I also have a more elaborate brussels recipe here (loads of pop!) with breadcrumbs on top. This reminds me of my Hungarian mother’s take on most vegetables. Except that as in all Hungarian recipes sour cream had to be involved. With cauliflower it was a whole head, steamed, and then spread with sour cream and topped with the buttered bread crumbs and then sprinkled with paprika. I still make it but minus the sour cream. This might be good with parsnips instead of cauliflower, no? I share your passion for parsnips, but when I searched I found only recipes which “included” parsnips–not one which “featured” parsnips. I thought of using parsnips instead of acorn squash in your recent Acorn Squash Wedges….and I may. But how about creating a special recipe for parsnips all on their own? I think our mothers went to the same cauliflower school – that is what I grew up with too (and still make, I’m embarrassed to say….). Thanks for the update! Oh gosh it is funny I bought a head of cauliflower yesterday to make your silky soup today. Wish I bought two. I want to try this recipe next. Not sure any cauliflower recipe can top your roasted cauliflower salad with olives and capers, but this is yummy, too! I only regret it took me 7 years to find your blog- o the catching up I have to do yet!! Thanks for all of the great ideas! Oh. My. Goodness! This is exactly how my German mom made cauliflower all the years I was growing up – just plain browned butter and breadcrumbs as a topping for steamed cauliflower. It was so crunchy and yummy. It’s my favourite way to eat cauliflower, too. You did it again! You managed to make something I don’t like, cauliflower,look so yummy! I just might give cauliflower another try ;) thanks for all the Thanksgiving dinner help. Mmmm. This sounds delightful in its simplicity. As others have mentioned, my go-to recipes for cauliflower have usually involved some type of cheese or cream sauce. But this? This might be recipe to end that trend. Can’t wait to try! Oh, Deb, you’ve taken me back to my ’50s childhood with this. Tossing them in brown butter breadcrumbs were the only way my mother could get my sister and me to eat either cauliflower or broccoli. I love to prepare them both that way even now, but rarely do because of the – well, you know – butter. Still, every once in a while, I throw caution to the wind… like, maybe, tonight. Cauliflower always needs help! Hooray for butter! I love cauliflower with my new favorite, kale pesto. I am now seven years old again. Except my mom did the cheese sauce PLUS the browned bread crumbs. And I was the little piggy claiming the bottom of the bowl. Love, love, love cauliflower – though for some reason I can’t cotton to Brussels sprouts, even though they’re close cousins. Re those heavy cast iron skillets, I used to hate them in my youth too; then spent my middle years using them all the time. Now that I’m (ahem) an elder, they’re too damned heavy again. Please pardon my very basic and quite possibly remedial question: Do you think Broccoli would be a reasonable substitution for the Cauliflower? Try as I have, I just am not a fan of the white stuff and much prefer the green stuff, though one substitution I’ve learned does not work is the above mentioned cheese sauce. It’s actually quite gross on broc, but I digress… Any thoughts? I haven’t met anything in browned butter that I haven’t liked, not to mention that most perfect combination of bread + butter. It doesn’t get much better then that! Terri — I don’t see why not. This looks delicious, and I can imagine the brown butter breadcrumbs working with other veggies, too! 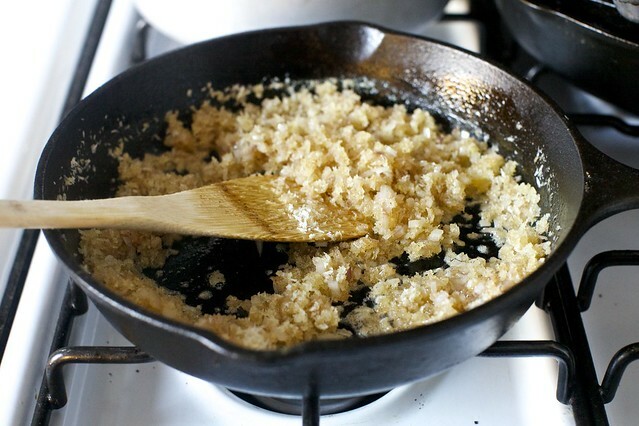 A cast iron skillet full of brown butter breadcrumbs – is there anything more lovely? Great looking recipe! This look delicious! You have such great recipes for the fall/winter weather! I would love to see more ethnic recipes! You should definitely try making Korean food. Korean stews/soups (soondubu, kimchee jigae, yukgaejang) are perfect cold weather dishes! my mother (she’s hungarian) always makes these sautéd bread crumbs to put on top of green beans. they’re yummy there too! Looks delish – I’m rediscovering my childhood love for cauliflower … but I’m really just commenting because I think you probably meant to link to yesterday’s drool-worthy recipe in your ‘More Thanksgiving this week’ paragraph. Yep, I’m one of those annoying people! Thanks, now fixed, I think. I stumbled on this site and I like the sounds of all the recipes discussed. Please tell me the site where these recipes are dos[;ayed so that I may read them. This is actually based on a traditional Polish style of serving cauliflower that my mom got from her mom and so on. In French cooking, this is referred to as Polonaise, just like Florentine would be with spinach. Sounds delicious. My mom used to make a main-dish cauliflower recipe that was a steamed whole head of cauliflower, then one or two beaten eggs and parmesan cheese poured over it, then cooked just until the egg was set. I think the recipe was from the Frugal Gourmet. I actually do it in the microwave for a quick dish with both vegetable and protein content! Definitely not just eastern European: my father-in-law in Piedmont, Italy, used to make a similar dish, but added chopped anchovies into the bread crumbs he was toasting. Delicious! This looks so good! 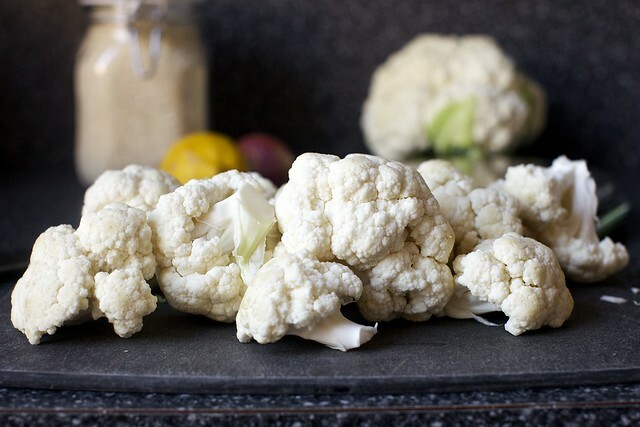 Cauliflower is one of my favorite vegetables and I can’t wait to try this ASAP. My sister-in-law use to make this for her kids when they were young but it never appealed to me… that is until now, since you’ve gone and added lemon, garlic and panko in brown butter. YUM! Also, I just wanted to say thank you for all of the posts this week. Your blog (and book) are brilliant – I enjoy both very much. And it’s so generous of you to share all of these fabulous recipes in advance of next week’s BIG meal. Thanks Deb (and I hope you’re taking the week off next week!). My grandma made this for us a few years back, and it definitely won me over to the cauliflower side. So so good. Thanks for the reminder to make this dish – I love your addition of garlic and shallots. No matter where you live – all moms know the good food! My mom used to make cauliflower with browned butter and breadcrumbs and I haven’t had that in years. Thanks for reminder! She cooked the whole thing in salt water though. No steaming :) The next cauliflower will be served like this! Oh, and yes, I think it’s a German thing – given that my mom was German. Am I missing something? Where is the secret picture? I cannot possibly think of cauliflower before a Jacob picture. Aww, that photo melts me! I would love to roast cauliflower and put this on top. MMM. My stepmother used to do this with asparagus, and we lived in New Jersey. I have to add to the chorus of “My mother made it this way!” and I have always loved it and made it for my family too! We also use the crumbs on broccoli and green beans. I always thought it was Eastern European in origin. Thanks, Deb, for reminding me to make it again! I haven’t had this for years but my Mum (whose parents were German) used to make it this way and I loved it. It was considered quite strange in New Zealand where most people eat cauliflower with cheese sauce (disgusting!!). you have inspired me to make it again. This is the first time ever that I have had a plan to make something (cauliflower) and the perfect recipe showed up in my inbox the same. I always read about this sort of serendipity in comments, but it never happens to me. Anyway, made it and it was delicious. My husband always has to add to anything I make (usually more spices, more butter, etc), and he didn’t change a thing. Thank you for sharing with us. I love your writing and your recipes. Happy Thanksgiving! Shocking indeed! Really. I was so alarmed, I misspoke and said boiling instead of steaming.., Just seems like you are missing out on so much potential flavor. I always roast (unless it’s in a gratin, pasta, etc). Besides, since when is roaring harder than steaming? My babushka and mom made this often, living on the border of Poland and Belarus. And I’m going to be honest: just butter and bread crumbs for me, no fiddling. Try fried breadcrumbs over green beans or gnocchi… To die for! I’ve been loving any kind of veggies this way for a while now. Just topping any soft veggies with some crispy something makes it so much better! I think I’ll roast the cauliflower before rather than steaming. More browned bits!! This is the only way I ate cauliflower as a child! My grandmother always served it with brown butter, my mom still does. I’m from Germany, so to me this is a German thing, I guess. Then again, it came from my grandma, whose mother was from Poland, so it might just as well come from Eastern Europe. YUM! Now I know, what I’ll have for dinner tonight. Thanks Deb! The breadcrumbs don’t stick to the cauliflower. When I pick up a piece of cauliflower, there is a shower of crumbs all around. It tastes great, but I thought that the crumbs would coat the cauliflower, not just sit on it. Was i wrong? Ronit — No, it doesn’t really stick. We press them in a bit, but they’re not going to stay there. You just eat them together on your fork. Dear Deb, are you secretly conspiring with my mother? It seems as if at least half the recipes you post come directly out of her kitchen. Type of food, combination of ingredients, method, you name it. From pizza to cauliflower, I know all that from my mum’s cooking. Cauliflower with brown butter crumbs are my dad’s favorite, so we had that quite often when I was a child. I’m Austrian, btw. Does your family come from here? Hi Deb, love these recipes that you do with the cauliflowers. I am so impressed that you can do all this fab food from such a small kitchen space. Big respect to you. My wife does a brilliant curried cauliflower, its straight out of a pakistani’s kitchen. I will post this to my new blog soon, probably get Xmas out the way first. Also – congratulations on the Babble awards, you deserve them! My mother would do this with bacon fat instead of butter, and of course, crumbled bacon was mixed with the breadcrumbs. Delicious! Crumbs and butter is a popular way to serve various cooked vegetables in Poland, and possibly other Eastern European countries. I read somewhere that in France this way of preparing veg is sometimes referred to as a la polonaise, but I don’t know if it is true. In any case, it is a taste of my childhood (I am Polish, but live in England). Delicious! BTW Deb, you are right: in Italy we “season” with salt&pepper and olive oil. Hi, I discovered your blog recently, and honestly can’t believe I’ve missed it all these years. Such great recipes and ideas, and I love your writing. Cauliflower is a family favourite in our home. I love it steamed with a herb and butter sauce, my husband likes it with breadcrumbs as in your recipe. My kids prefer it with cheese sauce. So, to keep everyone happy, we serve it steamed, smother white cheesy sauce all over, and sprinkle a generous amount of brown butter crumbs and a handful of parley. Bliss on a plate! This was a Sunday dinner staple on my german family’s table when I was growing up. Love it, love your addition of lemon zest/juice! Can’t wait to try it that way. AMAZING! Huge hit. Made it for tonight’s dinner of meatloaf and roasted purple potatoes. I am going to make it for Thanksukkah except will use brussle sprouts. Thank you Deb for this wonderful blog; you inspire me in so many ways. Those are really good photographs and the recipe is inspired. Thank you. Do you us ts as a side dish or can it be a main course meal? Hector — It is a side, but that doesn’t mean you cannot eat it for dinner. This looks delicious. 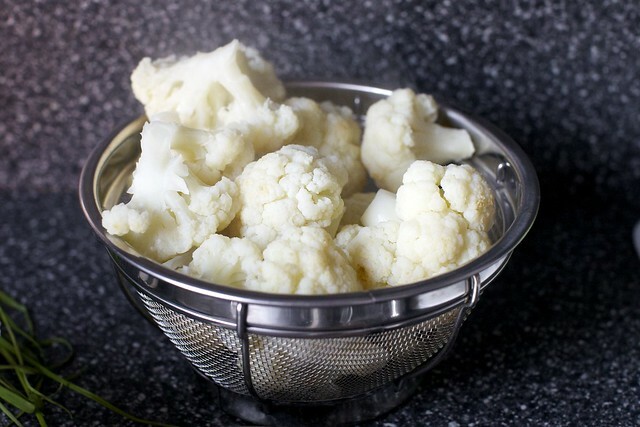 I love steamed cauliflower and need a new recipe to spice things up! I will be trying this in the near future! I have to say I thought this was my mother’s concoction, but it seems it may be a German feature of making kids eat cauliflower. Just like you I always found my cauliflower irresistable when my mother made this. Thanks so much for sharing. Yum! Looks great. The fam always complains about my love of cauliflower… this will spruce it up a little for them! Oh my goodness. I started off with cauliflower and chickpeas roasting with some nutmeg and cumin.. while it was roasted I kept browsing and came on your post with the fabulous idea of brown butter crumbs, so I combined the two recipes. Of course I have no panko or even white bread at home, so I buzzed a couple of rye dinner rolls in the foodprocessor to make crumbs. Lemon? Pshaw. Apparently left over dried lemon peel from brining the thanksgiving turkey would have to make do – I toasted that with the breadcrumbs. Tossed a bunch of capers into the butter/shallot/garlic mixture, and then topped the whole plate with some well aged parmesean. You know, I could eat this every day! And to think I’ve always insisted I hate cauliflower! Only problem is that this started out as a fairly light dish – roasted with the slightest bit of olive oil. Then thanks to you I went and added butter! This recipe seems like about half of a recipe I used to make about 40+ years ago when first out on my own. I hope Smitten Kitchen can come up with what I need to know as I am doing a Hungarian dinner tomorrow for friends of mine because I CAN’T FIND MY RECIPE FOR THIS GREAT DISH!!! HELP!!! Here is what I can tell you about what I remember of the recipe. I think the cauliflower was floured and then fried to a crisp state. But, was the cauliflower first par boiled? Also, as I recall the breadcrumb mixture was made with breadcrumbs (duh), dried parsley, some spices?, and chopped hard boiled eggs. all tossed in butter and in turn, tossed with the cauliflower. I think I am pretty close to having it right BUT my memory isn’t what it used to be–but what do you expect when you hit 70+ years old. An afterthought just occurred to me and that is that the frying of the cauliflower is what made this dish really special. I think I remember several years ago I might have used breaded cauliflower from the frozen section of the grocery store. That scenario was a real disaster so I guess that breading the cauliflower isn’t or wasn’t the way to go. Also, another thought has just occurred and that is would frozen plain cauliflower work better for frying than fresh raw cauliflower. I am in such a quandary–what to do? what to do? I just made this. Its really yummy, and the zesty lemon flavor is perfect. My only comment is that it doesnt actually serve 6-8. it should be doubled for an actual 6-8 portion. My Mother always served her cauliflower with either browned Italian style breadcrumbs or a cheesy sauce! Your posting was a trip to the past!! My mother (German) always made noodles and breadcrumbs, the butter fried breadcrumbs tossed with noodles and sprinkled liberally on our own plates with a german seasoning called Maggi, it’s kind of a german soy saucey thing but better! I made this yummy cauliflower for Christmas and turned the leftovers into a delicious frittata! Breadcrumbs and all, I recommend trying that! I’ve made this twice now and we’ve ADORED it both times. Thanks for sharing this gem. great recipe. I was thinking of making it for dinner but do you have suggestions what to add to it or am I missing something? I was thinking about making it with some spagetti carbonara in the weekend. I had two helpings for supper yesterday, super simple & delicious. Thanks, N.
This is typical Polish topping for vegetables in the summer time. Bot only for cauliflower, but also it goes well with baby potatoes, young beans, and in autumn with brussel sprouts. This was lovely; quick, easy, and best of all, tasty. I prefer roasted cauliflower, so to adapt the recipe for summer cooking (no oven, quick stovetop), I turned the cauliflower into couscous. Just chop the florets fine by pulsing in a blender or shredding on a box grater. 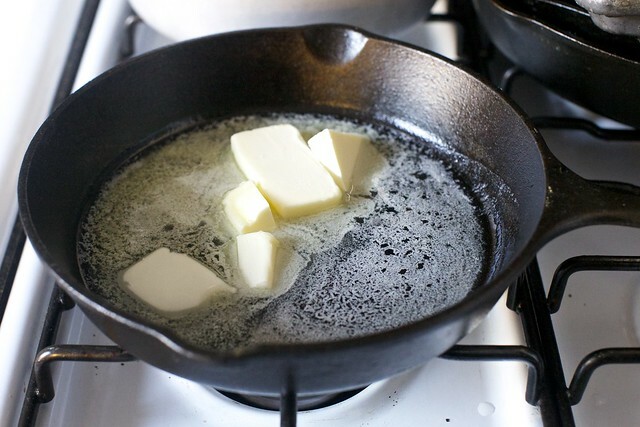 Put a large skillet on medium-high heat. Add just enough water to cover the bottom of the skillet 2-3mm deep and bring to a simmer. Add 1 T olive oil, cauliflower and shallots (instead of cooking the shallots with the panko). Stir well then cover and steam for 2 minutes. Uncover and continue to cook until water has evaporated and olive oil has been absorbed, stirring frequently, about 5 minutes. Assemble as directed by Deb (stir in lemon juice, top with panko etc). Yum!! I just made this (roasted cauliflower is so much better than steamed, in my opinion), and it was a hit! I found that the parsley made a big impact to the flavors too.Yum, yum. My Detroit grandmother made a version with crumbled soda crackers browned in butter – incredibly delicious! cant wait to try this. I don’t know why this doesn’t have more comments but it really should because it is absolutely DELICIOUS. I sometimes make an entire head of cauliflower like this and try to eat it all by myself. Rarely successful, always delicious. Hello, I just discovered this site! This morning, even before I had my coffee I saw a head of cauliflower that had been in my fridge over a week and thought I better use this up before it goes bad. I remembered a recipe my grandmother brought over from Hungary when they came to America in 1914. Yes, the dark ages but then I am 84 now! And I remember my mother making it when we were children. 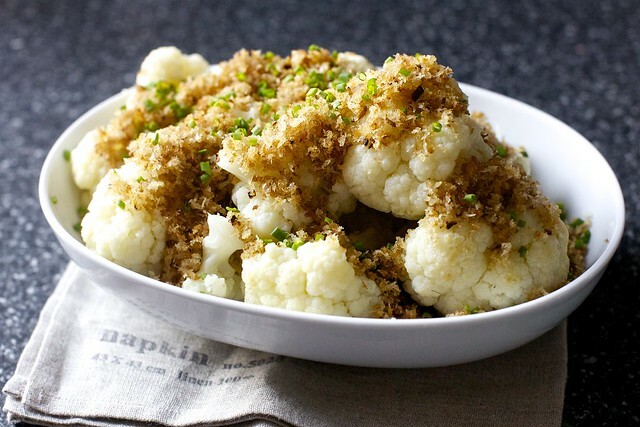 I have always loved the cauliflower and butter and bread crumbs and when I got this site this AM I was so excited I just had it for breakfast. Thank you Smitten Kitchen for this little bit of old country I had forgotten!! Thank you, Deb! Just tried this with some friends and it will become part of my regular rotation! Hi, just had a talk with my mom on phone awhile ago and she’s in Queens and i’m here in Manila. All through out our conversation she gave me all veggie recipes and this brown buttered cauliflower with panko was the first she instructed me. Well, am thinking of making this as one of my dinner dish. Thanks to them for letting me know that it’s a Polish dish. You’re a winner Deb! Deb this is the second time I am commenting on one of your posts today! I think I’m slowly making all the Smitten recipes! Made this tonight with scallops – very delicious and a wonderful way to “hide” cauliflower. Decided to roast it and then added the crumbs. Super easy, super delicious. Thank you! This recipe was a childhood favorite. I used to call it cauliflower with sand! I guess that doesn’t sound too ape rising but this recipe is so yummy! Absolutely delicious. The lemon made all the difference. Love the texture (roasted) with the crunchy breadcrumbs. Yummy. Another winner. thinking of this for thanksgiving…i know i can make the cauliflower and breadcrumbs separately and then put together and warm on thanksgiving. how do i store the breadcrumbs once cooked? fridge? not fridge? cauliflower has been on sale for the past two weeks so i bought some. i was firmly decided on making the cauliflower cheese, but then out of curiosity i decided to see what other cauliflower recipes you had. and now i can’t decide between the cheese, the tart, or this. fortunately, i know whichever one i go with it will be awesome because it’s 9:30am and my stomach is growling for…cauliflower? re: steamer baskets – what i do is add my water to the pot (i use my big oval rachel ray pot as it has a lot of surface area, so everything fits in one layer and you can get the lid on) and then crimp a sheet of heavy duty foil over the top, sinking it in an inch or so. stab it all over with a knife, bring water to boil, lay the ingredients on the foil, put the lid on, presto, steamer. this is how i do chicken wings, too before i bake them. Oh I really like cauliflower, this dish looks so delicious~~ Thank you for sharing!! It’s the best way to make kids eat cauliflower and green beans. My three year old loves it with just the fried bread crumbs and butter, but I am going to try with the other ingredients. Hi! If you steam these, do you skip the roasting part? Or do both? Up to you, but steaming is sufficient to cook it. i made this just last weekend and served it over wild rice to make it its own meal, and it was amazing. i was skeptical that the breadcrumbs would be that flavorful, but i was wrong and they were perfect–especially with the rice, since the excess crumbs got mixed in with it instead of just sitting at the bottom of the bowl. i made it again the next night at my sister’s request, but added some roasted broccoli and carrots to the cauliflower, which was also delicious. we did end up making an enormous amount (2 large heads of cauliflower, one head of broccoli, and somewhere in the vicinity of 6 carrots, and i tripled the breadcrumb recipe), but fortunately it reheats well in the oven (spread on baking sheet, 400 degrees, 10-ish minutes) so leftovers weren’t an issue. i just finished off the last of it for lunch today, and i’m sad to see it go.